The Rev. Al Sharpton on Sunday said he wants to explore a run for the presidency in 2004. Sharpton said he will help organize a national effort to find a progressive candidate to run in the Democratic presidential primary, "and I'm available to be that candidate." In a telephone interview with The Associated Press, Sharpton said that "the Democratic Party failed to protect us in the last election. They did not deal with the disenfranchised voters that were never counted. In many ways they took us for granted. ... We cannot afford to be marginalized." Noting the Rev. Jesse Jackson's runs for president in 1984 and 1988, Sharpton said: "Twenty years later, we need to do the same thing, and maybe we need another black activist preacher from New York to run, to galvanize people." He said his purpose would be to promote issues that concern blacks and progressives "and to win as many of these primaries as possible. It would not be just symbolism." Sharpton told Time magazine, which first reported the reverend's willingness to run, that the idea came to him while he sat under a tree in Sudan, which he visited in April on a fact-finding tour about slavery. He denied that he was taking advantage of the Rev. Jesse Jackson's tarnished image. "I'm not one to think that Rev. Jackson's finished," he said. "I'm not trying to take advantage of his travail. My rise is not at Jesse's expense. If I'm rising it's because I've done the work on issues like police brutality that affect huge numbers of our people." In January, Jackson acknowledged fathering an out-of-wedlock child with a woman on the staff of his Washington office. 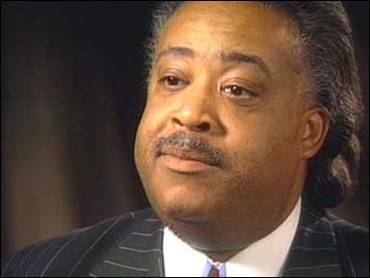 Sharpton ran for U.S. Senate in New York in 1994 and came in third in a four-way contest in the Democratic primary with 25 percent of the vote. In 1997, he took 32 percent of the vote in a Democratic mayoral primary.